At Mrs. Fields, we believe the best way to show your appreciation is to create moments that your customers, clients and employees won't forget. 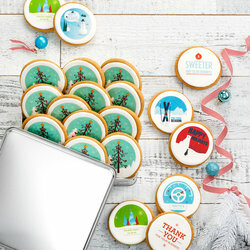 Make a delicious impression this season with business cookie gifts that will help your company put its best foot forward, whether as a sweet treat for clients and guests or as a fun way to engage with customers. Mrs. Fields also makes business gifting easy with our corporate gift baskets, which are a great thank you gift for clients, or a surefire hit at your next company get-together. Customize your gift basket or cookie tin with company branding and enjoy fresh baked logo cookies delivered straight to your office! Forgo boring crackers and cheeses, give your most important clients and customers what they really want: yummy cookies and treats. Our delectable business gifts make showing your appreciation easier than ever. We know because we've helped create memorable client gifts for decades. 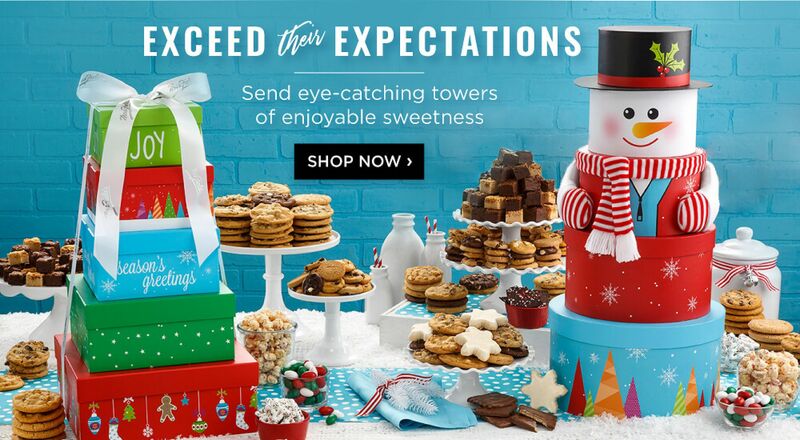 Simply choose the cookie gift, tin or gift basket you think your customer would like the best (hint: you can never go wrong with the classics), add a personalized message, and enter their address. Your customer's gift is shipped straight to their door. Make an impact by sending corporate gifts for clients featuring everyone's favorite cookies, including classic chocolate chip, luscious brownie bites, and other heavenly surprises. Everyone at your company loves cookies. It doesn’t matter if you're a manager, foreman, CEO, or head of the party planning committee, corporate cookie gifts filled with freshly baked cookies and treats are an excellent way to show your appreciation. Our collection of cookie gift baskets, boxes, and tins are packed with all of the favorites like chocolate chip, oatmeal raisin, peanut butter, and decadent brownie bites. They can be used as a morale booster during hectic weeks, given out as prizes in friendly competitions, or featured as a scrumptious treat at company parties. Either way, your employees and coworkers are sure to love every bite. Order your employee gift baskets today. Nothing's better than receiving a gift that was created just for you. Make a great impression on your most valued customers, clients and employees with custom corporate gifts from Mrs. Fields. 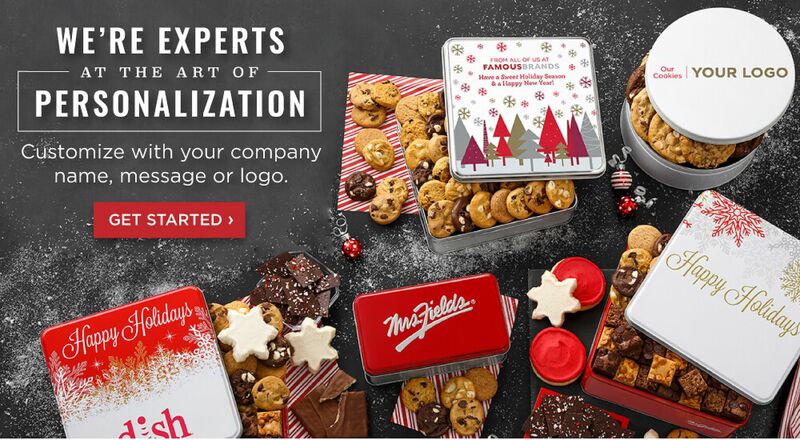 Our collection of customizable cookie tins, business gift baskets, and more are a surefire way to wow clients and customers. 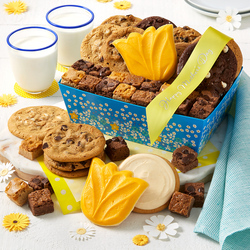 Pick from a variety of cookies, brownie bites, and other yummy treats packaged in beautifully crafted tins, boxes and gift baskets. Then add your personalized message for an extra special touch. Not sure what to say? Add a customer or client logo to our delicious custom logo cookies. Never let your clients forget your appreciation, no matter the time of the year. Our client gifts are great ways to send delicious thanks year-round. Select one of our many holiday and Christmas client gift baskets for your clients to share with their family. Packed full of classic cookies and specialty holiday treats, they serve as excellent reminders to relax and enjoy the little things in life. Don't forget to spread cheer after the holidays are over. Send business thank you gifts after important meetings or just to show your appreciation for their business. For even more great options browse our full selection of gourmet cookies!